We are seriously considering adding this to the graveyard of relevance. Is the TV show Survivor still popular? If you were born again after seeing these socks please email us. Because this Bible turns the sinners of the scriptures into the "super heroes" it is actually missing the whole point of the Bible. The men and women whose stories are recorded in the scriptures were NOT super heroes. Instead they were ordinary sinful human beings. Noah got drunk, Abraham was a liar, Jacob was a deceiver, Moses was a murderer, David was an adulterer and a murderer, Jonah was a disobedient prophet and Solomon probably had a sexual addiction. Do you see a theme here? If the Bible was about good versus evil then every single one of us would be on the side of evil because we are all wicked and sinful beings. The Bible is the beautiful story of God's redemptive work in the lives of evil sinners like you and like me. The men and women whose stories we read about in God's Word are not the super heroes. They are far from it. In fact, the only super hero we read about in the scriptures is Jesus Christ. When we take a closer look at Jesus we learn that He was the one true God in human flesh and He had come to redeem and save a lost and sinful world. Our Great God and Savior took all of our sins upon himself and swallowed them whole through his death on the cross and three days after we murdered Him Jesus defeated death itself by rising victorious from the grave. Who knew that the cross could be so fun and tasty? 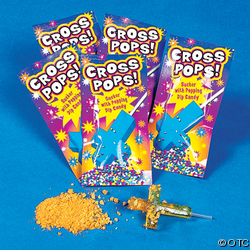 These cross pops include popping dip. How fun and kewl is that?! This outrageously ugly piece of Jesus Junk is made by the same people that made those scripture inserts for your shoes. This handy little item retails for $150! Oooops...guess they messed up on the year. That's okay. If they keep up dating the shirt, one of these years Christ will return and they'll look like prophets. In the meantime, they may want to quietly take this off the market and use the overstock for dust rags. 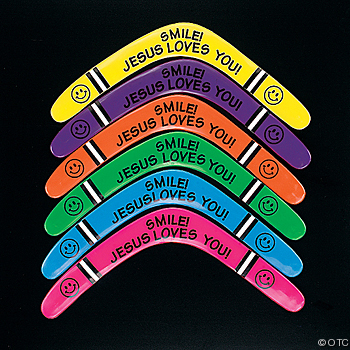 Imagine getting hit in the head by one of these and then chuckling and saying, "Wow...I guess Jesus really does love me." Respect Your Elders or Get Eaten by a Bear? Those of us who have kids actually kinda like this shirt.